NEW ORLEANS – There is something special about the combined-event athletes from the SEC and they proved it again this past weekend in Columbia, South Carolina. That’s why Texas A&M standout Lindon Victor cemented his spot on the most recent version of the Men’s Watch List that was released Thursday by the U.S. Track & Field and Cross Country Coaches Association (USTFCCCA) and Georgia senior Devon Williams found his way back on the ballot for the first time since March 16. Nine of the 10 men who were on the Pre-Conference Championship Watch List returned to the current index. Williams displaced Florida’s KeAndre Bates, who is one of three men in the “Also Receiving Votes" section. Edward Cheserek SR Oregon Distance Newark, N.J.
Christian Coleman JR Tennessee Sprints/Jumps Atlanta, Ga.
Chris Nilsen FR South Dakota Pole Vault Kansas City, Mo. Devon Williams SR Georgia Combined Events Marietta, Ga.
Also Receiving Votes: KeAndre Bates (Florida), Justyn Knight (Syracuse), Brian Williams (Ole Miss). It was back in March at the Texas Relays where Victor broke Trey Hardee’s collegiate record in the decathlon by scoring 8472 points, seven more than the future Olympic silver medalist. If you thought Victor was done, then you had another thing coming. This past weekend at the SEC Outdoor Championships, Victor one-upped himself by 67 points to push his record to 8539. Victor broke the Day 2 scoring record of 4145 points set by Jake Arnold in 2007 in the process by amassing 4174 last Friday. Williams chose not to compete in the decathlon, resting on the laurels of his 9th best total in collegiate history from earlier this season (8345). Instead, Williams toed the line in the 110 hurdles and long jump in an effort to help the Bulldogs capture more team points. What Williams ended up doing is nothing short of remarkable. Williams won the event title in the 110 hurdles with a time of 13.37 that tied the collegiate lead and beat former The Bowerman Award Watch List member Grant Holloway of Florida to the line by .05 seconds. You can’t discuss the SEC Championships, however, without talking about what Tennessee’s Christian Coleman and Texas A&M’s Fred Kerley accomplished. Coleman swept the 100- and 200-meter titles and became just the 8th man in world history – first collegian – to go sub-10 (9.97) and sub-20 seconds (19.98) in those respective events in the same day. Kerley clocked the 2nd fastest time in collegiate history over 400 meters in the prelims on Friday (44.09) and doubled back with the 8th fastest time in a winning effort in the final (44.30). Three-time The Bowerman Award finalist Edward Cheserek won the 10000-meter title at the Pac-12 Championships and fell short of the 5000-meter collegiate record at the Payton Jordan Invitational earlier this month. Cheserek actually finished 4th in Palo Alto, California, while it was Justyn Knight of Syracuse who put his name on the All-Time Top-10 instead (4th, 13:17.51). Colorado State’s Mostafa Hassan remained undefeated in the shot put this season as he won the Mountain West Conference title. Hassan is ranked No. 1 nationally with his heave of 21.31m (69-11) from the Mt. SAC Relays back in mid-April. It was at those same Mountain West Conference Championships where New Mexico’s Josh Kerr doubled up on event titles. Kerr won the 800 in 1:48.05 and the 1500 crown in 3:46.39. Over in El Paso, Texas, at the Conference USA Championships, UTEP’s Emmanuel Korir chose to pick up the 400-meter title and did so in convincing fashion. Korir lowered his PR to 44.53 (converted to 44.64 for altitude) and has a big decision to make as to whether he’ll try to double up at NCAAs or hold steady in one of his two events. Like his teammates, Texas A&M’s Ioannis Kyriazis won an SEC title. Kyriazis launched the javelin 80.15m (262-11) to beat the closest competitor by more than 9 feet. South Dakota’s Chris Nilsen made quick work of the pole vault field at The Summit League Championships where he won with a clearance of 5.51m (18-1) for his 16th bar of 18 feet or more this outdoor season. The aforementioned Bates and Knight were among three athletes who didn’t receive enough votes to be on the Watch List, but warranted recognition from The Bowerman Award Watch List Committee. Ole Miss’ Brian Williams is the other. 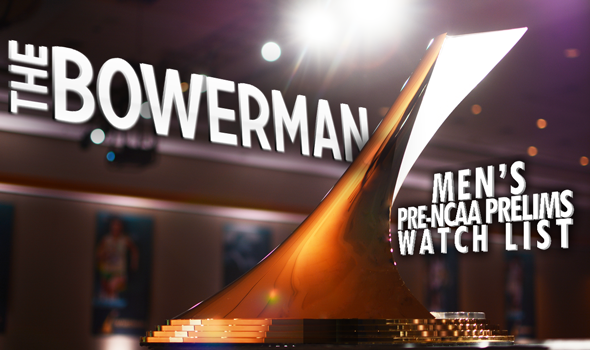 Be sure to check back on TheBowerman.org for the next Men’s Watch List that will come out June 5 in advance of the 2017 NCAA Division I Outdoor Track & Field Championships.